In light of today’s shakeups, Apple has posted a revised organization chart on its website. The chart lists the newly minted CEO Tim Cook, as well as the other executive staff. It also shows Jobs’ new position as Chairman of the Board and Cook’s new Board seat as well. 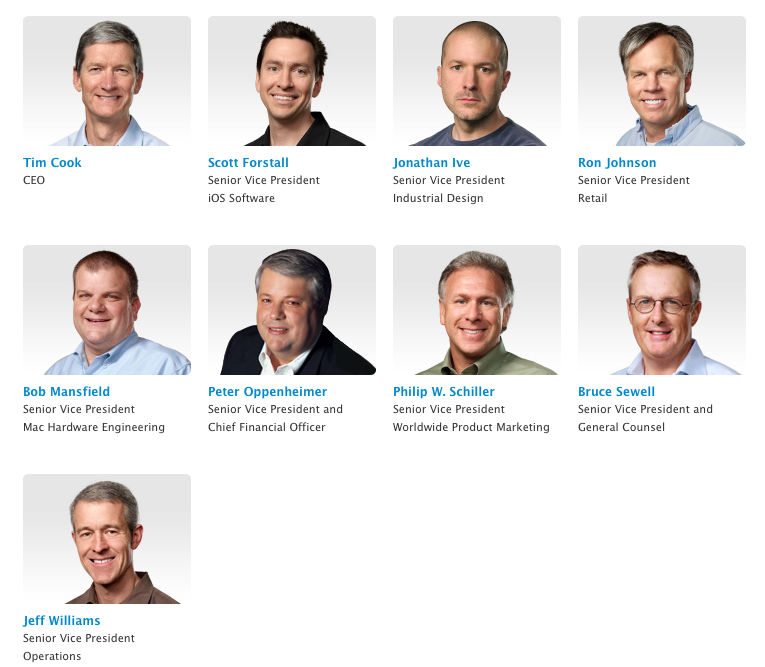 Notable in the bottom row is Cook’s likely successor as COO, Jeff Williams. Still present in the top row is the soon-to-be-departed Ron Johnson, Apple’s head of retail who is leaving for JC Penny. I have to admit that It’s an odd sight without Job’s familiar face gracing it. A front row seat to Steve Jobs’ career, by Robert Scoble. Read next: Tim Cook is now Apple's left brain, but who will be its right?